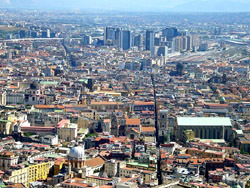 Spaccanapoli is the main street that traverses the old, historic center of the city of Naples, Italy. The name is a popular usage and means, literally, "Naples splitter". The name is derived from the fact that it is very long and from above it seems to divide that part of the city.